As you plan your 2006 race calendar, you might want to consider entering a “Series” competition in your area. I have really enjoyed the Trail Runner Trophy Series and Fuel Belt/Ultrarunner.net Series I competed in over the last couple of years for two reasons. First, you get to see the same group of runners more often throughout the year. I’ve made some great friendships (both racers and supporters), found new training partners, and cheered on some spectacular breakout performances, largely because I got to know people over the year. The second reason I enjoy a Series is that it helps me step up my training from “single events” to looking at the whole calendar year. I know I have to do a long run each weekend, so I often sign up for many weekend races to make sure I get in the miles (you don’t have to “race” all of them). Oh yeah – you also get outside a lot more often! Series competitions can vary, but typically require you to race at least three races. Points are calculated based on finish place (where you get 10 points for first, 9 for second, etc.) or finish time (the winning time divided by your time x 100; this helps account for “break out” performances). Prizes can range from cash purses to unique awards, and often are awarded to both overall and age group champions. I’ve compiled ~20 of the biggest Series in North America so you can get an idea of what is out there. Some of these Series require travel (such as The Grand Slam), while others are locally focused (such as many of the Colorado Series). Note that many of these require pre-registration at the beginning of the season (and some seasons start in January! ), so be sure to get signed up. I hope this helps with your race planning! If you know of a Series that I missed, please leave a comment and let me know. Arguably the most competitive Series, with many races being USATF championships as well. Includes Western States 100, Kettle Moraine 100, Leadville 100, and White Mountain 50M among others. Final race in Series (Mt. Masochist) counts for 50% more. Free entry. Open and Masters overall competition. Since 1986, 100 miler racers have become “Slammers” by completing the Western States 100, Wasatch 100, Leadville 100, and Vermont 100 in a single season. $80 entry fee. Note that some of these races are just a few weeks apart, so it’s only for the super-trained out there. Other slam “flavors” also exist, including the Eastern Slam, Rocky Mountain Slam, etc. (check run100s for details). Two competitions (ultra and marathon-and-under) in this two-year-old competition. Broadest range of races, with over 130 races to choose from across North America. Automatic entry when you race any participating race. Overall competition for ultras, overall and age group competition (10 year age groups) for marathon-and-under. Short course trail racing. Races get progressively longer, from 5 miles to 13 miles. Men/Woman overall competition, no age group competition. Races range in distance from 50k to 100k. Jeff Riley, 2005 men’s champion, completed all 7 races, while Kami Semick, the 2005 women’s champion, completed only 4 races (but won them all). Overall and age group (10 year age groups) competition. Wide range of distances (50k to 100m) including popular races as Western States 100, Way Too Cool 50k, and Miwok 100k. ~2 races per month throughout the year. Overall, age group, and team (runners club) competition. Best five races of eight (must do at least four races); points determined by finishing time. Well-timed Series, with roughly one race each month. Trail and road events, ranging from 50k to 100 mile. Best six of 17 races; points determined by finishing time. Many races throughout the year, including the Angeles Crest 100, the San Diego 100, and San Diego 24 hour (most age group winners finished one of these). $20 additional fee. Both “short” (5k) and “long” (10k) course competitions. No age group competition. Free event entry for runners 18 and under. A short course Series in small towns of Colorado, including Littleton, Evergreen, and Golden. Races range from easy 10k’s to more challenging runs such as the 10k at 10,000 feet and the Steamboat Marathon. Overall champions (1st-3rd) and age group champions (10 year age groups). Races range from 5k to marathon distance, all across Colorado. Sponsored by Colorado Runner Magazine. Overall and age division champions (open, masters 40-49, grand masters 50-59, and senior masters 60-69). Mountain running series, with most races at altitude (8k-11k feet), distances range from 5k to half marathon. Overall and age division champions. 10k/30k options available, all leading to same points competition. Open and masters division champions. Over 800 runners participated in this six-year-old Series. Three categories – 5k, 15k, and “mega-saurus” mix. Mountain bike races also available. Overall, age group, and team competition. VERY short course racing (2.5/5miles). Overall and age group champions. Includes 50k, 50 mile, and six hour events. Mostly trails. Men/Woman Open or Veterans (50+) competition. David Horton’s ultra Series. Two 50k and one 50 mile race. $50 entry fee for Series. Races range from 10k to 15 miles. Series in its second year. Overall and age group champions (1st and 2nd). Short course racing all across Canada, with over $40,000 in merchandise. Two divisions include “short” (5-6k) and “enduro” (10-15k). Overall competition and age group competition (10 yr age groups). Summer Series with races ranging from 5k to half marathon. Overall champions only. New team category for 2006. 2006 is the 18th year of this event, with races ranging from 10k to100 mile, as well as six hour and 24 hour runs. “Trail Series” focuses on 10k-32k events, “Ultra Series” on 50k+ events, plus a “50k challenge” series. Overall, division (open, masters 40-49, and super masters 50+), plus unique awards. Races range from 52k to 100 mile. “Alberta Triple” focuses on three 100k+ events. Overall and age division (34 and under, 35-49, and 50+) champions. Races range from 50k to 100k, including flat and hilly courses. Age division (under 40, 40-49, and 50+) champions. You guys know I’m a big fan of the runner’s high, that physical/spiritual feeling that chills you out once you’ve worked a good tempo for 80 minutes or so (at least that’s where it kicks in for me). New research around the physiological/chemical definition of the runner’s high (often called “anandamide” – click here for my crash course) continues to abound, with promising applications in psychological applications such depression and diet. Preclinical lab tests found that a new drug, URB597, blocked the degredation of naturally-produced anandamide and “triggered feelings of well-being…resulting in measurable antidepressant effects”. It’s the RUNNER’S HIGH IN A PILL!!! They say it’s non-addictive, but my trail running regiment might suggest otherwise. Click here for the press release. A study performed by Oliver Ullrich and others at the Otto-von-Guericke University Magdeburg in Magdeburg, Germany, has shown that anandamide may reduce inflammation in the brain and may be helpful in treating brain damage diseases. No need to wait for clinical trials to test it yourself – just get out and run! I hope you are all enjoying the winter season. The Ithaca Journal recognized ultrarunner Rebecca Harman as one of the outstanding local athletes in the New York area. Becky had an amazing season, include setting course records (and top three finishes) at the Highland Forest 1-2-3 (30 miler), Finger Lake 50k, and Mendon Trail 50k. She also won her third straight Finger Lakes snowshoe championship, competed in the Tinman and Lake Placid Ironman triathlons, and was named Ultra Runner of the Year by the Western New York Ultra Series. Way to go Becky! You can read more about Becky and other NY all-stars here. The Western New York Ultra Series write-up can be found here. I'm a big fan of the runners high. I think it is a spiritual and physiological journey that is best explored rather than explained. But if you prefer a guided tour, here's a class you can take at North Andover Catholic College/Merrimack College in North Andover, MA, called "The Spirituality of Running". Dr. Warren Kay designed the class to look at such traditional religious acts as prayer, sacrament and pilgrimage and draw parallels to running. You can find an interview and story here. "(Running) is not a break from reality but an escape to reality," Kay said. "This is what the course is about." Merrimack College student Jim Nugent had an awakening at some point during the class that was, if not profoundly spiritual, at least surprising. He learned to love running. "I hated running through high school," said Nugent, who played football and baseball. "Running was a punishment in sports." 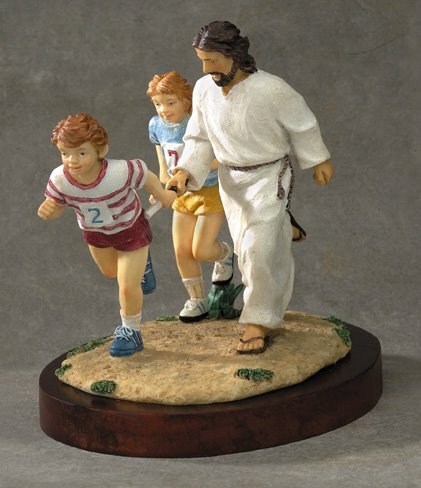 But Kay's reading assignments and class discussions got him thinking about how running has a lot in common with, for example, a traditional religious pilgrimage. It involves movement, Kay said, as well as simplicity of dress, a sense of fellowship with people around you and a temporary release from the social ties of life, work and school. And, Kay said, like a sacrament, running can be a way to experience a tangible, outward physical sign of inward grace and sacred reality. I hope you're all having a great holiday season. I got some snowshoeing in yesterday at Tahoe, and my hip flexors are now reminding me that it may look like running, but it ain't running. When it comes to mountain running, few can keep up with Alamosa, CO-based Simon Gutierrez. A four-time Teva Mountain Running Team member with a sub-30 minute 10k PR, Simon has been known to devastate course records at some of the world’s toughest climbs, such as the Pike’s Peak Ascent (he won the 13.8 mile climb in 2003 with an age group record of 2:13), the Mt. 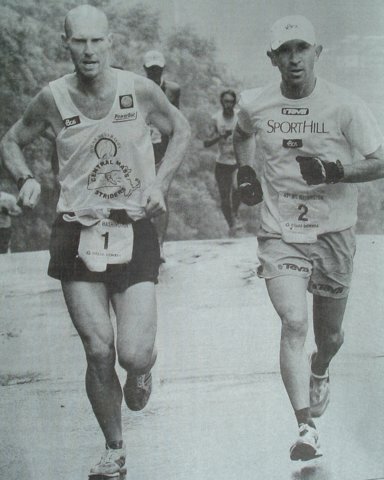 Washington Hill Climb (three- time winner), and the 9-mile La Luz Mountain Race (which he has won 7 times). His performance on the world circuit has also been amazing, with top 20 finishes in World Trophy events in Italy, New Zealand. He was recently named the 2005 USATF Mountain Runner of the Year. I caught up with Simon on e-mail to talk about his season, and give us some tips on mountain running. First, congratulations on your performance in New Zealand at the World Championships! Can you tell us a little about how that race went? Well, I had a solid start and by the top of the first climb I was in the top 5 or 6. The pace was intense for the first 5 min or so then it felt comfortable. Then came the descents and I lost some ground on the leaders by the end of the 1st lap. It is no secret that I don’t enjoy downhill racing but I was pleased that I was not totally useless on them. In after thought it may have been better to have gone out harder for the first climb. From then on, for the last 2 laps my focus was on running strongly on the uphills and staying on my feet for the downhills. I lost a place or two each lap (again…my downhill skills , though much improved this year) the last 1/2 mile was all fun and I got goose bumps knowing I had accomplished my year long goal of a top 10 finish. I was pleased with last years 17th place but to get top 10 on an up and down year really opened my eyes to the fact that I can compete with the top mountain runners in the World. Do you try and stay 100% focused on mountain running, or do you fit in road races/ultras/etc. as well? I consider myself a good road and xc runner at the 5km- 10km -1/2 marathon distances year round. Basically, from May to September my training is geared towards the mountain races that I will be competing in. I only do a couple of trail/ mountain runs a week, but they are quality runs usually mimicking upcoming races.There is a treadmill session every 10 day’s or so (15% incline for an hour of fartlek) to work on my ascent running. The rest of my training is done on flat dirt roads with an emphasis on 10km training. I was probably in 14.20 5km / 29.30 10km shape just prior to New Zealand. I ran 30.28 for a 10km in July( 6000ft elevation) right smack in the middle of the mountain season. I understand you were a cross-country star and a road marathoner (PR of 2:18) before your mountain running days. What led you to the hills? I’ve done alot of different types of running through the years...... In 1983, third at Footlocker/ Kinney Nationals. A 29.45 as a 17year old on the roads. Was 16th in the world junior xc champs in 1984. I went to four straight NCAA XC Championships at the university of Arizona (1984-1988), although never making All – American. During the 90’s I was living in Sweden and ran alot of European XC / track races. I’ve run some marathons, lots of roadracing and even a PR 63.48 half marathon in Holland. As for the mountains, I grew up in Albuquerque and my coach used to take me out on Sundays and we’d have these incredible runs that were so fun. I’ve always been more competitive in XC, so when you throw in the altitude, longer race times and the ascents, I tend to do quite well. Plus after so many years competing, it was a nice change to get back to the mountains. You are out there trying to run as fast as you can…..in very unsuspecting elements! It’s hard to imagine you fit time in for job. Can you tell us a little about what you do outside of trail running, and how you keep it all balanced? The morning hours are “Simon time” when I relax and get in my main workout of the day. 10-12 miles varied between easy runs and hard intervals etc….. I get in another 35- 45 min workout in the evenings after work. I work as a outpatient Physical Therapist, from 11.30 – 5 pm or so. This fall I have been working with rehab and prevention of running injuries with the Adams State College XC and track teams for 5-6 hours a week. It is nice to be able to share my experiences and apply my manual skills with the men’s and women’s teams. It's a priviledge and a unique opportunity for the runners that has come about through the cooperation of the schools athletic trainer, my employer and Coach Martin, whom I can't say enough about! When I first got out of PT school, I tried working 8-5 and running competitively. It was not a good scene. I was tired at work and tired on my runs. I would get to races wishing I was still in bed. Now I can focus on my training and when I get to work I feel refreshed and motivated to do a good job. My evening workouts are a flush-out session for the mind and the legs. I really appreciate my situation because I have the time to look forward to my training and actually enjoy going to work each day. Hmmm, I honestly enjoy being out on my daily runs…just running. There is so much to see and experience, regarding nature and wildlife that I never get bored. Here in Alamosa we have the most spectacular surrounding mountains I can just stare at them on my runs and dream. Also there is a part of me that enjoy’s a good challenge. I am always setting goals for myself that are challenging and I do my best to accomplish them. These day’s I am not so heartbroken if things don’t turn out as planned. I still get to go for a nice run the next day and that is where my enjoyment of running is. After many years of running, I know my body and know what works for me. If I want to excel in a certain area of running whether it is mountains, roads or XC I am very relaxed knowing that if I do the training that the results will come. I enjoy speaking with other runners and continue to learn new things about training and my physiology every year. For sure Mt Washington Road Race ( 7.6 miles at 11-12 % incline …a sick grind) then probably the Challenge Stellina in Susa, Italy (15km ascent trail) and, of course, my hometown race La Luz Trail run which has everything any race I have run has as far as difficulty, elevation and vertical incline. 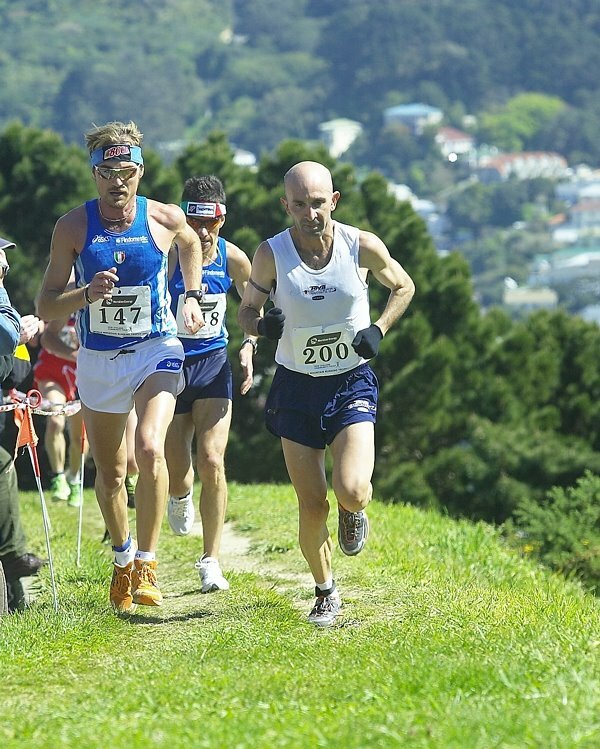 Lastly, just about any XC race I can find…..
Mountain running seems to be much bigger outside the US. Would you agree? Why do you think that is? Do you think it will change? I ran into this while living in Sweden and I think it is similar for mountain running. Europe has a club system which is evident in just about every small town or village. Each club put on races and every now and then there are bigger races with prize money and such. For mountain running, there is a governing body in Europe which coordinates a Grand Prix and these races draw the worlds top mountain runners every year. You look at Europe geographically and it is like traveling from US states to state…So if you live in Europe you can race each weekend without going broke and maybe even come out ahead financially if you are running well. Here in the USA most mountain/trail races do not have prize money and even more seldom do they not have travel/lodging etc. So the athletes are doing it for other reasons than monetary. We have so many other sports here in the USA that sponsorship etc is limited. However, things are changing for the better here in the USA. The general athletic public seems to become more and more interested in trail running and that has added numerous events nationwide to compete in. I am grateful for the races that exist and definitely hats off to all the runners because without the numbers there would be no opportunity to have the competitions we have now. Lastly, a few training questions. What’s a typical training week look like for you? How many miles? What kind of hill/speed work prepares you for mountain running? I do about 100-110 miles a week year round. The only thing I change is the intensity/quality depending on what I am preparing for. Usually 2-a-days unless I do a long run on Sunday….I’ve gotten away from a 7 day training cycle. Mine is more 12-14 days where I get in one long run…some mile repeats on the ditchbanks , hill/trail or mountain sessions and some fartlek or races …We used to joke around in college that the week was not long enough to get in all the type of training one needs, so I have learned to make the week longer. I am very consistent in my training. I am out at 9 am and 6pm daily. As for workouts, they are geared toward 10km type racing. I like to feel that I can run a fast 5km then I train specific for races that are coming up. The last 5 weeks prior to Wellington, NZ I was hitting some steep hill repeats, up and down for an hour, to get my muscles ready for the course. All summer I did gradual up and down mile repeats every 10 days or so at 10000 ft elevation. Tuesday AM Hills mountains 10 -12 % incline…7 min up 5 min down repeat 5 times ( race course similation for worlds in 4 weeks) PM 40 min easy….flat…. Well I eat pretty healthy most days. Lots of chicken, lean beef, vegetables, salads…oatmeal, blueberries and peanut butter for breakfast. My mother’s enchilada’s are a favorite. I have no problem going out for a burger or pizza with friends and I don’t think I have ever turned down a good Microbrewery beer. The trick is to turn down the 2nd or 3rd one…I’ve also got a sweet tooth for cookies….and I don’t turn those down after 1 or 2 ! Pre-race or workouts are usually some good strong coffee, a bagel with peanut butter and honey and if it is a long race , a balance bar. I also drink a carbohydrate/protein sports drink before during and after my training sessions. I think you heard of a treadmill run off in Salt Lake City. No stairmasters for me. I do like the elliptical because it mimics “uphill running”. The last 2 years I have done more of my recovery runs on an elliptical trainer. I don’t differentiate between 40 min of easy running or an evening on the elliptical, especially now in the winter when it is dark and cold. I recover faster and definitely have better quad strength for hill climbing. Of course as the season progresses I do more and more “running” after work, it works out great as the daylight increases I gradually do more outdoor "runs". I do 3-4 snowshoe races in Jan to March. It is tough and we often race at 10000ft elevation which is a nice way to get into the mountains when the trails are snow packed. Oh my, I could probably write a book about the blunders I have made through the years. What to avoid….definitely overtraining. It is easy to go out and train as hard as you can , but are you getting anything out of all your hard work ? It may look like I train hard but I have built up to this level over 20 years. On my easy day’s I run as slow as needed to allow for recovery. I get ribbed about this all the time cause I can run real slow some days......I rarely go all out in training. Most efforts are controlled and I pick up speed over the course of several months of training. I really believe that by giving the the body time to adjust, we can avoid most overuse injuries. It is just difficult to find the right individual balance. If you enjoy running , then you should focus on what makes you happy and keep doing it. My career has had many ups and down. I had a great HS career, followed by a dismal collegiate career. Then all of a sudden I made the senior USA world xc team in 1989 and I was back on track so to say….My first 2 world trophy races were disasters and finally I have gotten it right the last 2 years…I forget who told me this but we all have adversity, it is what you do with it that matters most. Lastly, you got to put your health first, then training. Staying healthy is my main goal year after year. Any tips you would like to pass on to somebody trying their first mountain run? Just have fun and enjoy the tranquility. Make sure you know about the course and have adequate gear for the race. Train on the surfaces you will be running on......Usually the weather is always changing here in Colorado so don’t be surprised if it snows/ rains or is blistering hot. After your first one, go back for more !!! Right now ( December) I am in an base building phase for Nov/December ( 100-110 miles weekly with 2 hard sessions a week) . My immediate goals after the New Year are a sub 15 min 5km here in Alamosa ( 7600ft ) and then getting close to 14 min for 5km and 29.30 for 10km in March / April / May. I can’t believe it but I will be 40 in March! I want to run some PR’s next spring and hope by being a master runner I will get the chance to go to a handful of the top road races in the country. I will be back on the mountain tops come June – September with plans to improve on my 10th place finish at the world trophy race and there are a couple of mountain races that I know I can run faster on …... Most of all just having a lot of fun, meeting my old friends and new faces all over the world. Best of luck. Thanks for a great interview! Mick (from the UK) asked a few questions on the blog, and the next thing I knew they started coming in from everywhere! I guess it's time for the readers to interview the interviewer. I'm going to take a stab at a few of the questions (and steal a few as well for future interviews - great questions, you guys!). If you have other good links or would like to ask questions yourself, feel free to leave a comment below. Q: In one of your early blog entries you give a bit of background on how you got into trail running. Can you try and describe what the enjoyment of running is to you (sorry guess I should open with an easy question!) and what got you hooked onto trail running when you started? I got into trail running in 2001, just after the 9/11 attack on New York. I had a bizarre personal connection with the tragedy (you can read about it here), but a new friend (my dog, Rocky) helped me find my way to the trails before I could make it to the beer fridge each morning. I wasn't a runner before that, unless you count joining the track team to meet girls. Since then, trail running has become a big part of me. Maybe it's because it came at a time in my life where I needed change, but one thing for sure, trail running has been a spiritual awakening. Since every step on the trail is new, it helps me stay in the moment and forget my burdens. The surrounding wildlife is so rich and full of history - the deeper you go into the forest, the more it feeds your soul. Clock a few miles, and you remember that. A few more, and life simplifies as you can no longer focus on your daily stressors. Spend a few hours out on the trails, and you realize your place in the world. It keeps me humble. It felt like that that first week in September, 2001, and it has never gone away. And, oh yes, you can eat anything you want which is a huge plus. I'm a sucker for pizza, milkshakes, creme brulee, and chocolate, so I need a calorie-burning hobby for sure. It's all pretty fun. In the marathons, I enjoy the race itself a lot, especially if it's a new trail. I've found with the ultras that finishing feels REALLY good. ;-) I find that I stick to my training if I've signed up for a number of races, and it gives each training day out a bit more sense of purpose. I'm a big fan of "destination racing", where you pick a trail/place you've never been, then spend a few days in the area to experience as much as possible. See the sights, meet some locals, eat the local fare, etc. I often have so much fun that by the time I get to the race, it doesn't really matter how I finish. No worries. I'll run States someday. I live about 1/3 the time in the Lake Tahoe area, so States has a special attraction to me. There's a lot of "ya ain't a real trail runner unless ya done States" in these parts. Plus I love the history of the event, the location, and the fact that there are 200 podiatrists on hand. I'm contemplating doing a 100-miler next year, but haven't pinned one down yet. If you have some suggestions, be sure to let me know. I'll let you in on a secret on how "I" pick my race schedule. My wife, Christi, doesn't run (unless chased), but she does love to travel. So each year I give her a list of 10-20 races that sound like fun, and she picks 2-3 that she likes, largely because they are near places she wants to go. In 2004, it was Hawaii and Hood River, OR. In 2005, it was Boston, Deadwood, SD, and Aspen, CO. For 2006, she is hoping for New Mexico, Death Valley, and perhaps New Zealand. We use a few races as "anchor" races, blow a ton of frequent flyer miles (a good side effect of my job), and then I try and cram in as many local races, particularly new ones, as possible. I do take a break from racing, although I still exercise a lot in winter. I run/swim as much as before, but keep it aerobic as much as possible (no speed work or hill sprints) and don't worry too much about my mileage. My beer and wine intake definitely creeps up. Come January, I'll ramp up the training again. Still working on the 2006 schedule. I do use the Trail Runner Magazine Trophy Series as a guide, so when that schedule comes out (Feb or so) is when I make the plans concrete. I am planning on going to Oakridge, Oregon in July for a trail running extravaganza (more on that later), and will do Boston again if my newly-qualified friends are up for it. I'm currently baiting Christi with a spa/run weekend at Death Valley in February. Q: What does a typical workout week look like for you? I have the opposite problem from you - my house is in the Santa Cruz Mountains, where nothing is flat. My casual 5-mile run in the neighborhood has 1,100 vertical feet, so I get lots of hill training in whether I want to or not! But it means I have to make sure I practice flat (or pavement) if the race requires it. It took my four times longer to recover from the Boston Marathon than any ultra I tried, largely because I wasn't used to holding a fast pace on pavement. I've found two things that help with hill training, and both should be fine on a small section. On the uphill, keep your back straight and lean forward until you feel yourself "falling forward" just a bit. That's your optimum posture. Then turn over your legs quickly in short strides, pacing yourself based on your breathing. Do this regularly on a 2-3 minute hill, then you will have a "rhythm" for any hill you encounter. If you know your "rhythm", then you can tackle a 3,000 foot beast without too much trouble. Q: Would you tell us a bit about your blog...what do you enjoy most about blogging? Will you continue with blogging in the new year (I certainly hope so)? I'm so glad you enjoy it! It's been a great way to meet a lot of interesting people that share a common passion, and share some of my wife's fabulous photos. There are no rules in the blogosphere, so I've had fun experimenting with interviews and "products I would like to see". I work in technology too, so the blog is helpful to get a first hand knowledge of RSS, XML, moblogging, and all the other cool stuff coming down the pipe. Most of the comments that come in are from people who like the "keep it real" tone of the whole thing, so I'll stick with it. Lord knows I'll keep screwing up races, so humility should abound. I certainly plan to continue in 2006, and am open to any suggestions. Short of Karnazes' book, Ultramarathon Man, I haven't read any running books. I'll have to check out your suggestion! I do enjoy Trail Runner Magazine and Ultrarunning Magazine, as well as many other running blogs out there. Q: What running accomplishment are you most proud of? Do you have a favourite race story/incident (e.g. funniest/thoughest/ weirdest/most enjoyable) to share with us? Most proud of? That's hard to say. 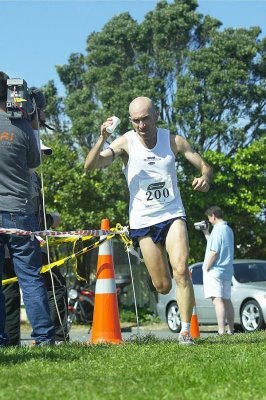 Certainly winning the 2004 Trail Runner Magazine Trophy Series (the largest trail running series in the world) is a big one, although I enjoyed the racing more so than the winning. I still hold my "firsts" in high regard - my first marathon at the Golden Gate Marathon, my first ultra at the Rucky Chucky 50k, etc. - that's one thing every runner has, and it's pretty special. Hands down, my craziest race was The Mountain Man Half Marathon in Hood River, OR, in 2004. About two miles into the race, I pulled off the front and followed the pink ribbons, only later to find out that the race organizers had used the same color ribbons that the Forest Service used to mark dead trees. I got hopelessly lost, as did EVERY runner, and there were no maps available. At one point, some hikers stopped me and said, "unless you plan on swimming across the Columbia Gorge, you're going the wrong way". With their maps, we found out I was over four miles off course. They filled up my water bottles, gave me snacks, and sent me on my way. I was so angry, I ran like a banshee. I ended up getting third overall. Crazy! Q: Now for some of your own 'regular' interview questions... - Any tips you have for somebody who's just starting out with trail running? - What are your favourite races/ locations? - Have you experienced any running related injuries and how did you deal with them? For new runners, I say CONGRATULATIONS! Starting is by far the hardest part. Just keep with it for a few months and you'll see it gets much easier. I've learned all my tips from asking other runners during races, so don't be afraid to ask. They learned the same way. As long as you're outside, you're 99% of the way there. My favorite races tend to be "whatever race is next". Some of my past favorites have been the Waterfalls of Big Basin Marathon, the Tahoe Rim 50k, and anything around the San Francisco Bay Area. If you don't mind some hills, you'll be pressed to find better views. No injuries so far, short of a few bouts of overtraining (I find this out when my resting heart rate jumps 20%). I've found as long as I swim 1-2 times per week, the early signs of injury tend to disappear quickly. I'm a big fan of Injinji socks too - I've been blister free since I started wearing them, and "foot recovery" was the toughest part for me. Thanks! 2005 was a lot of fun, and my first real foray into the ultras. I have a lot of learning left ahead of me, that's for sure. I really enjoyed racing some races hard, and some just for fun. Balance is good. Most of my pics come from Christi, my wife. If your significant other has artistic skills, then let me suggest getting her one of the new Canon EOS or Rebel cameras. Your blogs will be gorgeous! Similarly, many of my pics come from those professional photographers on the course that you see all the time. Most of them have been very cool about letting me use them for the free blog. I train solo, aside from running with Rocky. I do enjoy running with others, but I don't have a lot of neighbors willing to put in some long miles at 6am. Ha! I guess "great" is a relative term. I'm still nowhere near the level of most of the elites, and still consider myself more "good" than "great". But I did get a lot faster in 2004, and I think that came from working up gradually over 2003, and adding speedwork in 2004. But I feel I still have a long ways to go. No steriods for me, but I do use E Caps, Endurolytes, and Hammer's Recoverite. And I eat A LOT. Aha! You must be a fellow blogger! No, they aren't paid ads. I run for both the Inov-8 and Injinji Race Teams and am huge fans of their products, so I put them up there. Similarly, I like the Trophy Series, so that's up there too. I've had some offers for ads, but I felt it would change the nature of the blog too much to get paid. It's a lot easier to ask for an interview if you say "it's all about the love of the trail, baby". You got it. I'll try and crank out another in the next couple of weeks. Thanks for pointing me to digg - very cool. Hey, I try to mix in some shorter races too! Each distance is challenging in its own way. The ultras are simultaneously achievable and prone to disaster, so I have lately been obsessed with that specific adventure. The Trail Runner Magazine Series has so many races, it's easy for me to fit it to my heavy work travel schedule. I did complete the Fuel Belt Series this year too (I got 8th), but hadn't thought about it until late in the season. Now that I'm doing more ultras, I should probably check out the other Series too. Certainly the Montrail Series is the monster series out there. I tell you what - I'll do a blog article on all the Series I can find and we'll see. Less pounding, good cross-training. Plus it's fun to go fast! I would probably be best off to stick with all-running, but I enjoy the variety. I find it much easier to bike with friends than run too. I work in high tech, usually in product design or marketing. I focus on starting new software companies, taking their products to market, and then getting them public/selling them a few years later. This means I'm usually flying 80-100k miles per year as I visit all the customers, go to conferences, work with investors, and visit field offices. At one point I had over 500k frequent flyer miles. The travel can be tough, but I really enjoy the work. Trail running has made the travel much more enjoyable since I can see something other than "downtown and a hotel". Nope, no kids of my own. We have Rocky the pug and two cats. But I'm lucky to have many nieces and nephews, and I enjoy spending time with them. 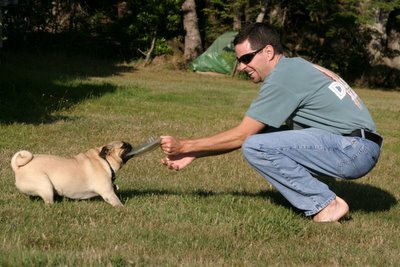 They all love Rocky the pug too. Thanks for the questions, you guys! Great stories - 24 Hours of San Diego, Yiannis Kouros Sets 6-day World Record Again, HUFF 50, etc. Yiannis Kouros set a new world record for the 6-day race at Colec. If you haven't read about this guy, definitely check it out - he holds every 12-, 24-, 48-, and multi-day race in the world. Read about here, and get a great profile on him written in 1996 here. Frank Purdy, Copy Editor for the Yakima Herald, joins in on the San Diego One Day Race and gives his first person account of his 100km+ success here. It's a great article. A good story on the HUFF 50k (here), one of the largest 50k's in the nation with over 700 racers. Massachussets-based ultrarunner/Ironman/duathlete Bob Eckerson is written up here. The dialog about him and his pacer is funny, as is his near-drowning experiences in his first triathlons. Congrats the 2005 USATF Mountain Runners of the Year! On Saturday, December 3, the 2005 USATF Mountain Runner of the Year awards, Ultrarunner of the Year , and Contributor of the Year awards will be presented at the Hyatt Regency Jacksonville Riverfront, Jacksonville, FL during a breakfast banquet as part of the USATF annual convention. The USATF Mountain Runner of the Year award recipients in the open category are Simon Gutierrez, Alamosa, CO and Laura Haefeli, Del Norte, CO and Bernie Boettcher, Silt, CO and Lisa Goldsmith, Nederland, CO in the masters category. The USATF Ultrarunner of the Year award recipients in the open category are Anne Lundblad who will be presented with the Ruth Anderson Award, and Dave Mackey who earned the Ted Corbitt award. Masters Ultrarunners of the year are William Emerson and Tania Pacev. The Contributor of the Year has been awarded to Teva. A special celebration for the Colorado winners unable to travel to Jacksonville will be held on December 11 in Boulder. Simon Gutierrez, 39, Alamosa, CO earned his spot on his fourth consecutive Teva U.S. Mountain Running Team with his win at the Northfield Mountain Race (MA). He was the first American at the past two World Trophy events where he finished 17th in 2004 and tenth in 2005. He set a course PR at the Challenge Stellina race in Susa, Italy where he finished sixth. Gutierrez won this year’s Mt Washington Hill Climb (NH) and his seventh La Luz Trail Mountain Race (NM). He is employed as a physical therapist at the San Valley Regional Medical Center and works with the cross country and track student athletes at Adams State College assisting with the prevention and rehabilitation of injuries. Bernie Boettcher, 43, Silt, CO was second master runner in the USATF Trail Championships and was the top American at the Masters World Mountain Running Championships in Keswick, England, in September where he finished 20th in the 40 - 44 age group (26th Overall in the World against all Masters). He was the Trail Runner Trophy Series Masters Champion in 2004 and showed his prowess in snowshoe racing as the top Master at the North American Snowshoe Championships placing third overall. Bernie says of his involvement in mountain and trail running, “I believe my relentless promotion of the sport has inspired others to run more. I've tried to do it through example.” Boettcher is a columnist for Trail Runner magazine and an accomplished artist working in media as diverse as sculpture and oil painting. He designs all of the Teva Vail Mountain Trail Running series T-shirts. Boettcher spends time running near the trails and open space surrounding his home with his girlfriend Jeanne Blatter. Lisa Goldsmith, 41, Nederland, CO had a stellar year in 2005. She started the year with a win at the Maui Run to the Sun (her first ultramarathon) and followed up with a win at the Pikes Peak Ascent and was second (first master) at the Barr Trail Mountain Race. Goldsmith was the first master at the USATF 10Km Trail Championships, the Northfield Mountain Race, and the Teva Vail HillClimb. Goldsmith’s successful season extends from races to hosting numerous clinics in support of the sport. She is a licensed massage therapist. This is the seventh year for the USATF Mountain Runner of the Year awards. Criteria for this year’s selection included top results in US mountain/trail competitions and international competitions during 2005, current USATF membership, and serving as an ambassador for the sport. Anne Riddle Lundblad, 39, Asheville, NC was the top American at the IAU World Cup 100km finishing with an impressive silver medal, just seconds out of first place. Lundblad led the team to a gold-medal finish and earned a spot on the 2006 100km team with her top-ten finish. She was victorious at the Mountain Masochist 50 Mile (VA) where she set a course record and won the 2004 USATF 50Km Road Championships (GA) also in course record time. She won the Promise Land 50km (VA), tied for first at the Carrboro 50Km (MD), and was second at the Mount Mitchell Challenge 40 Miler (NC). She also set course records at the Virginia Creeper Trail Marathon, the Great Eastern 50Km (VA), and the Bel Monte 50Km (VA). Lundblad when hearing of her nomination said, “I am thrilled to have been nominated for this honor! I know that there are many women and men who have had an incredible year, and I am pleased to be included in their ranks.” Lundblad also serves on the USATF Ultra task force. She is the mother of a six-year old daughter and shares the trails with her husband Mark who is a top ultrarunner. Dave Mackey, 36, Boulder, CO is the repeat winner of this award. 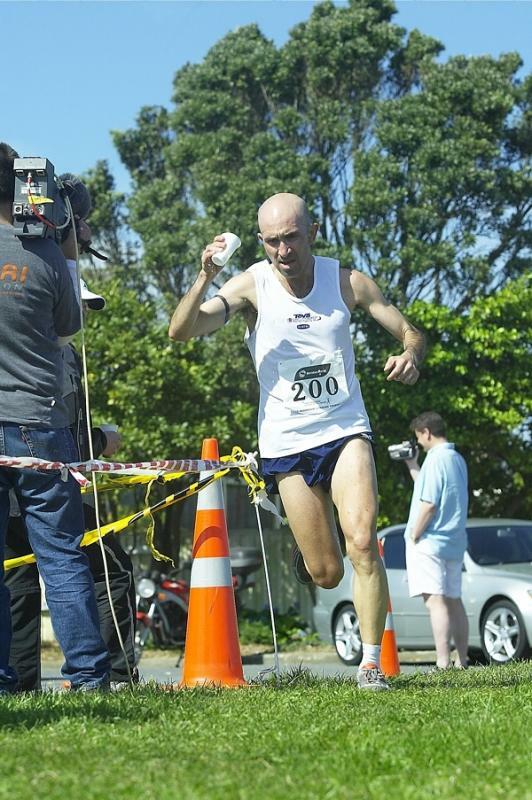 Mackey was first at the MIWOK 100Km (CA) posting the second fastest time on record. He was the U.S. 50Km Trail National Champion at Golden Gate Headlands (CA) in a course record time, was a member of the winning USATF 50K Team Championship (with Bryan Dayton and Paul South), first at the Mountain Masochist 50, and winner of the Way Too Cool 50Km (CA). Mackey is also a talented international adventure racer having competed in many events at the elite international professional level. He competed in many snowshoe races, and several shorter running races (including the National 10Km Trail Championships.) He is a four-year board member of the All American Trail Running Association and is an active member of the Boulder Trail Runners. Mackey is employed as a real estate agent and professional athlete. William Emerson, 41, Portland, OR is also a repeat winner of this award having earned masters honors in 2004. 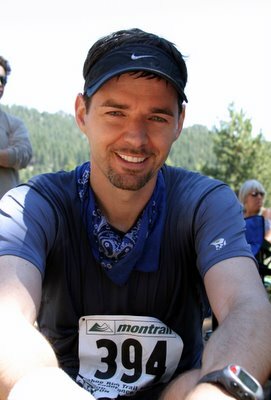 Emerson posted many top finishes in 2004-2005 including wins at the Ron Herzog 50K (WA), the Hunter S. Thompson 50K (WA), the Hilto to Valcano 50K (CA), and the Quad Dipsea 28 miler (CA). He was fourth overall and first masters at the McDonald Forest 50K (OR), second overall and first master at the Siskyou Outback 50K (OR), and second overall at the USATF 50 Mile Trail Champs White River 50 (WA) and Masters National Champion. He finished third overall and was masters champion at the USATF 50k National Trail Championships (CA). Emerson serves on the USATF MUT Council. Tania Pacev, 46, Littleton, CO finished ninth in the World at the IAU World Cup 100Km in Lake Saroma, Japan with a time of 8:29:19 and along with her teammates won the gold medal in team competition. With her top-ten finish, Pacev was named to the 2006 100Km World Team slated to compete in South Korea in October 2006. She is the winner of the Trail Runner Trophy Series Marathon & Shorter Division. She was top master at the Leadville Trail 100 Miler (third overall), top finisher at the Goblin 50Km (UT) and Greenland 50Km (CA), set a new record at the Spring Desert Ultra 50 Miler (CA), and placed second at the Sunmart Texas Trail 50 miler. She will be representing the U.S. at the World Masters 100km Championships in Argentina on December 11. Pacev is a realtor with Re/Max 100, Inc. in the Denver area. Criteria for ultraruners of the year included place finish in USATF national championships, record or outstanding performance in other ultra distance races, (road, trail, track) or sanctioned international events, overall performance record for the year, athlete must be a USATF member, athlete must be over 40 for masters award consideration. For the USATF MUT Contributor of the Year, Teva became the first two-time recipient having earned this honor in 2002. Teva is a leading supporter of mountain running most notably as the title sponsor of the U.S. mountain running team. Teva also sponsors a nationally acclaimed mountain running circuit in Vail, Colorado and sponsored three of four selection races for the team in 2005. Teva has designed trail running footwear to meet the needs of the trail and mountain running athletes and includes top trail and mountain runners in their advertising and promotional materials. Other Contributor of the Year nominees included Montrail, Seattle Running Company/Scott McCoubrey owner, and Trail Runner magazine. Montrail is the sponsor and founder of the Montrail Cup and supporter of numerous trail and ultra events nationwide and also supports athletes on their "team" with product support, sponsorship, and promotion in advertising to raise awareness of the sport and its athletes. McCoubrey directs the Bridle Trails Races, the USATF 50-Mile National Trail Championships, and the Cougar Mountain Trail Series. He founded Summer Cross Country/Trail Running Camps for High School Kids, and leads weekly runs in the Seattle area for all ability levels. He is the guiding force for many ultra runners including notable elite performers, Ian Torrence, Hal Koerner and William Emerson. His store sponsors numerous regional races, including the Capital Peak 50M, Cle Elum 50K, Silver Tip 50, Mergeo.com Adventure Racing Team. Trail Runner magazine supports trail running in editorial and with subscriptions/magazines for events. The magazine has been involved with the ever-popular Teva Mountain Games this year sponsoring the athletes of the year and the organization and execution of the second annual Trail Runner Trophy Series, a point-based series consisting of over 100 trail races and 20,000 runners spanning distances ranging from 5Km to 100 miles. The celebration for the Colorado winners will be hosted by the LaSportiva/GoLite Running Team at Sherpa’s Restaurant, 825 Walnut Street, Boulder at 5 p.m. Contact Buzz Burrell at 303-499-8118 for additional details.